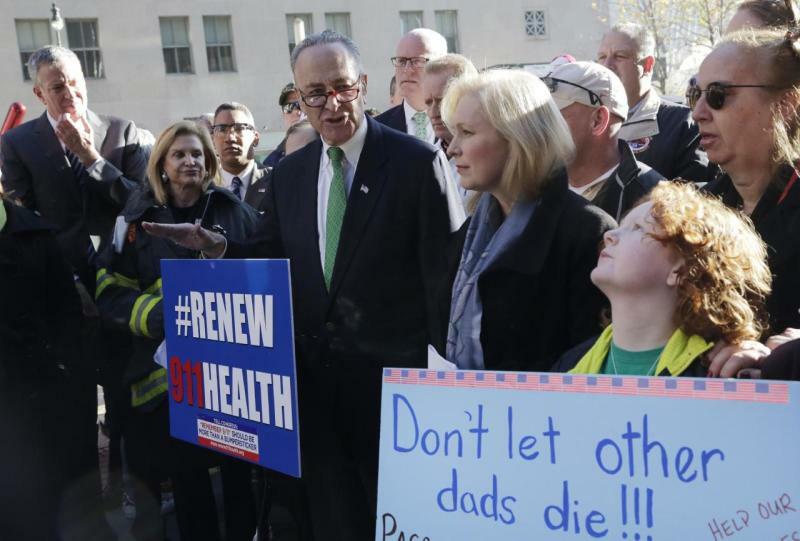 NEW YORK (AP) — At a rally featuring speeches by nearly a dozen lawmakers, the loudest message of all was delivered by a 9-year-old boy who didn’t say a word. Jack McNamara, a fourth grader, held a sign that read “Don’t let other dads die!!! I miss my Dad, FDNY Firefighter John F. McNamara,” words that were surrounded by hearts, American flags and a call for a fully funded renewal of the Zadroga Act, legislation that provides health benefits for first responders who grew ill after the Sept. 11 terror attacks. The World Trade Center Health Program, which provides health monitoring and treatment for first responders, expired this fall but has enough funding to operate into next year. The victim’s compensation fund expires Oct. 1. The Zadroga Act, named after a responder who died after working at Ground Zero, first became law in 2010 after a debate over the bill’s cost. Proponents are seeking the law’s permanent extension in part because some illnesses may not manifest until years later, after the statute of limitations for worker’s compensation or certain state laws may have run out. House and Senate Republicans have generally been supportive of the program but have opposed its permanent extension due to concerns about its cost — approximately $7 billion — and because they say they want the chance to periodically review it. Sen. Charles Schumer said Sunday that Democrats thought the law would be part of a five-year, $305 billion transportation bill passed last week but it was excluded at the last moment. He called on lawmakers to renew it this week before Congress goes out of session for the holidays. Schumer urged Senator Majority Leader Mitch McConnell and House Speaker Paul Ryan, both Republicans, to act this week. Neither man’s office immediately returned requests for comment. Firefighter John F. McNamara spent about 500 hours at Ground Zero looking for his fallen brethren. He died in 2009 after suffering from colon cancer. He was 44.